Raadpleeg ook literatuurlijst niet-toxische middelen en behandelingen specifiek bij darmkanker van arts-bioloog drs. Engelbert Valstar. Afgelopen week was ik in Gent met een patiënt met darmkanker met uitzaaiingen in zijn buikvlies om te kijken of een PIPAC behandeling nog iets voor hem zou zijn. PIPAC - Pressurized Intraperitoneal Aerosol Chemotherapy - is het toedienen van vernevelde chemotherapie in de buikholte via een kijkoperatie. PIPAC wordt vooral gebruikt voor buikvliestumoren, buikvlieskanker, blinde darmkanker, uitzaaiingen vanuit eierstokkanker en darmkanker en soms zelfs vanuit maagkanker, alvleesklierkanker en borstkanker. Het gaat dus vooral om de tumoren te bestrijden die zich in het buikvlies bevinden of aan de buitenkant van in de buikholte gelegen organen. 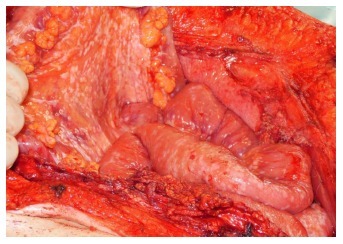 Foto: Diffuse peritoneal tumor dissemination. World J Gastrointest Pharmacol Ther. 2016 Aug 6;7(3):343-352. PIPAC een min of meer vereenvoudigde vorm van HYPEC maar dan zonder verwarming - hyperthermie van de chemo is uitgevonden door een arts in Bochum en wordt in Europa alleen gegeven in Bochum en Gent. In principe duurt de PIPAC ca. 4 uur en kan de patiënt als de PIPAC 's morgens wordt gegeven de patient 's avonds weer naar huis. De bijwekringen zijn goed hanteerbaar en de PIPAC wordt door patiënten over het algemeen goed verdragen, aldus dr. Willaerts en blijkt ook uit studies. Er is al wel onderzoek gedaan maar nog geen gerandomiseerde placebo gecontroleerde studies omdat dat bijna niet mogelijk is en ook ethisch niet verantwoord zou zijn zo vertelde mij dr. Wilaerts, de arts die ik sprak in Gent. De PIPAC wordt wel gedeeltelijk vergoed door de verzekeraars (ook voor patiënten in Nederland maar wel vantevoren aanvragen) maar de vernevelaar moet wel zelf worden betaald. In Gent kost die ca. € 1.800,--. Een PIPAC is herhaalbaar en ook te combineren met al of niet systemische chemo en wordt als er herhaald kan of moet worden gemiddeld 1x per 6 weken gegeven. Wat mij wel verbaasde is dat dr. Willaerts nog nooit van hyperthermie had gehoord. Zelfs wist hij niet dat in de Daniel den Hoed, het aAMC en het Verbeeten Instituut moderne hyperthermie machines staan die o.a. veel gebruikt worden voor baarmoederhalskanker, mond- en keelkanker en borstkanker. De nieuwe hyperthermie machines daar die het lichaam omhullen zouden m.i. uitermate geschikt zijn om vooraf en daarna toe te passen samen met de PIPAC. Ik heb in ieder geval de patiënt waarmee ik in Gent was aangeraden en hij ging dat ook doen want had er wel al enige ervaring mee, om de dag voor de PIPAC behandeling electro hyperthermie te doen en wellicht ook enkele dagen erna. Interessant is ook dat een recente studie nog heeft uitgewezen dat een PIPAC invloed heeft op DNA mutaties die zijn gerelateerd aan immuunreacties. Ik moet zeggen dat de PIPAC een interessante behandeling is m.i. 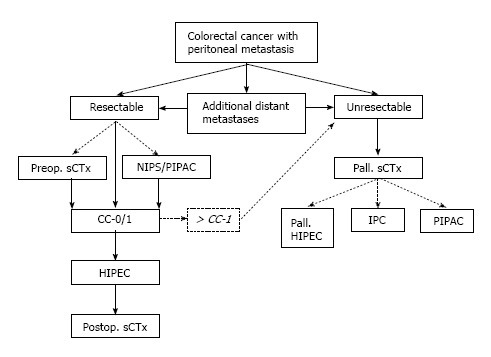 Therapeutic options for peritoneal metastasis arising from colorectal cancer. Pressurized intraperitoneal aerosol chemotherapy in women with recurrent ovarian cancer: A phase 2 study. Safety and feasibility of pressurized intraperitoneal aerosol chemotherapy (PIPAC) associated with systemic chemotherapy: an innovative approach to treat peritoneal carcinomatosis. Van voorgaande studies zijn ook referentielijsten bekend die onderaan dit artikel staat bij het abstract van de studie. Quality of life of patients with end-stage peritoneal metastasis treated with Pressurized IntraPeritoneal Aerosol Chemotherapy (PIPAC). EORTC-QLQ30 functional scores. 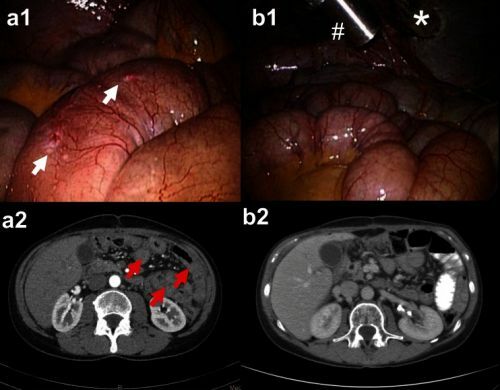 Left panel: in 91 peritoneal carcinomatosis patients classified according to their survival at time of assessment; right panel: in a subgroup of 48 of those patients having received at least 2 PIPAC at 6 weeks intervals. X-axis: days until death. Y-axis: score in %. PIPAC is well tolerated and active in women with recurent ovarian cancer and warrants further investigation in these patients. Gynecol Oncol. 2015 May;137(2):223-8. doi: 10.1016/j.ygyno.2015.02.009. Epub 2015 Feb 18. Tempfer CB1, Winnekendonk G2, Solass W3, Horvat R4, Giger-Pabst U3, Zieren J3, Rezniczek GA5, Reymond MA3. Recurrent ovarian, fallopian or peritoneal cancer with peritoneal carcinomatosis (ROCPC) is resistant to systemic chemotherapy. We assessed the safety and activity of laparoscopic pressurized intraperitoneal aerosol chemotherapy (PIPAC) in women with this cancer. In this open-label, single-arm phase 2 study, patients underwent 3 courses q 28-42 days of PIPAC with doxorubicin 1·5 mg/m(2) followed by cisplatin 7·5 mg/m(2). A pressure of 12 mm Hg and a temperature of 37 °C were applied for 30 min/course. The primary endpoint was the proportion of patients who had an objective tumor response (OTR) according to RECIST version 1.1 criteria. Analysis was by intention to treat. Secondary endpoints were tumor regression on histology, PC Index improvement on repeated video-laparoscopy, and quality of life measured with the EORTC QLQ-30 questionnaire. Sixty-four patients were enrolled. Laparoscopic non-access rate was 11/64 (17%). 53 patients were eligible for analyses. 33/53 (62%) patients had an OTR - three had a partial response and 30 patients had stable disease. Tumor regression on histology and PC Index improvement were observed in 26/34 (76%) and in 26/34 (76%) patients who underwent all 3 PIPACs. There were no treatment-related deaths. No grade 4 toxicity was observed. Grade 3 toxicities were trocar hernia (n=2), bowel obstruction (n=2), abdominal pain (n=2), hematoma (n=1), intraoperative bleeding (n=1), and cystitis with urosepsis (n=1). EORTC QLQ-30 global physical health scores, nausea/vomiting, appetite loss, diarrhea, and constipation improved during therapy. PIPAC is well tolerated and active in women with ROCPC and warrants further investigation in these patients. PIPAC with low-dose cisplatin and doxorubicin was safe and induced objective tumor regression in selected patients with PM from recurrent, platinum-resistant GC. First survival data are encouraging and justify further clinical studies in this indication. J Gastrointest Surg. 2016; 20: 367–373. Pressurized intraperitoneal aerosol chemotherapy (PIPAC) is a novel technique of intraperitoneal chemotherapy. First results obtained with PIPAC in patients with advanced peritoneal metastasis (PM) from gastric cancer (GC) are presented. 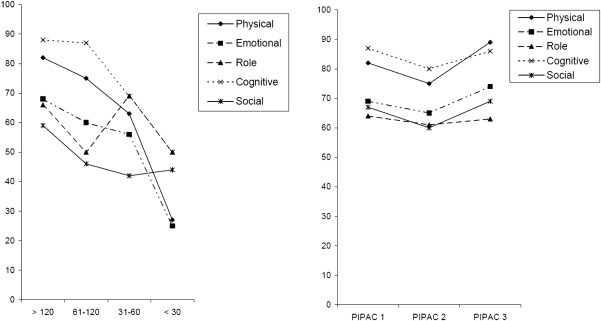 Retrospective analysis: Sixty PIPAC were applied in 24 consecutive patients with PM from GC. 67 % patients had previous surgery, and 79 % previous platinum-based systemic chemotherapy. Mean Peritoneal Carcinomatosis Index (PCI) of 16 ± 10 and 18/24 patients had signet-ring GC. Cisplatin 7.5 mg/m2 and doxorubicin 1.5 mg/m2 were given for 30 min at 37 °C and 12 mmHg at 6 week intervals. Outcome criteria were survival, adverse events, and histological tumor response. Median follow-up was 248 days (range 105–748), and median survival time was 15.4 months. Seventeen patients had repeated PIPAC, and objective tumor response was observed in 12 (12/24 = 50 %): no vital tumor cells = 6, major pathological response = 6, minor response = 3. Postoperative adverse events > CTCAE 2 were observed in 9 patients (9/24, 37.5 %). In 3/17 patients, a later PIPAC could not be performed due to non-access. Two patients (ECOG 3 and 4) died in the hospital due to disease progression. The online version of this article (doi:10.1007/s11605-015-2995-9) contains supplementary material, which is available to authorized users. In summary, molecular changes of peritoneal cancer during pressurized intraperitoneal aerosol chemotherapy can be documented and may be used to refine individual treatment and prognostic estimations. BMC Cancer. 2016 Aug 19;16:654. doi: 10.1186/s12885-016-2668-4. 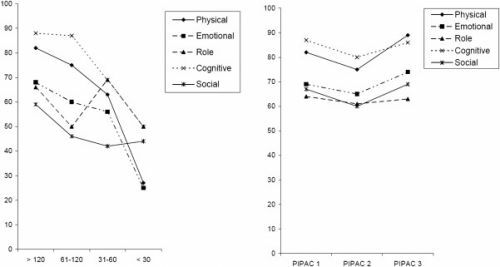 Dynamic changes of tumor gene expression during repeated pressurized intraperitoneal aerosol chemotherapy (PIPAC) in women with peritoneal cancer. Rezniczek GA1,2, Jüngst F3, Jütte H4, Tannapfel A4, Hilal Z3, Hefler LA5, Reymond MA6,7, Tempfer CB3. Intraperitoneal chemotherapy is used to treat peritoneal cancer. The pattern of gene expression changes of peritoneal cancer during intraperitoneal chemotherapy has not been studied before. Pressurized intraperitoneal aerosol chemotherapy is a new form of intraperitoneal chemotherapy using repeated applications and allowing repeated tumor sampling during chemotherapy. Here, we present the analysis of gene expression changes during pressurized intraperitoneal aerosol chemotherapy with doxorubicin and cisplatin using a 22-gene panel. Total RNA was extracted from 152 PC samples obtained from 63 patients in up to six cycles of intraperitoneal chemotherapy. Quantitative real-time PCR was used to determine the gene expression levels. For select genes, immunohistochemistry was used to verify gene expression changes observed on the transcript level on the protein level. Observed (changes in) expression levels were correlated with clinical outcomes. Gene expression profiles differed significantly between peritoneal cancer and non- peritoneal cancer samples and between ascites-producing and non ascites-producing peritoneal cancers. Changes of gene expression patterns during repeated intraperitoneal chemotherapy cycles were prognostic of overall survival, suggesting a molecular tumor response of peritoneal cancer. Specifically, downregulation of the whole gene panel during intraperitoneal chemotherapy was associated with better treatment response and survival. Reageer op "PIPAC - verneveling van chemotherapie toegediend via kijkoperatie in de buikholte voor met name buikvliestumoren geeft goede resultaten"